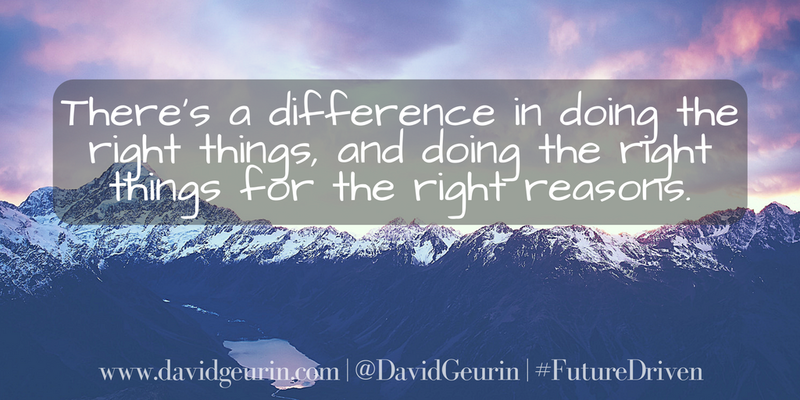 The @DavidGeurin Blog: Culture of Compliance or Culture of Character? Culture of Compliance or Culture of Character? Someone with many years in education was visiting our building recently and commented, "I don't think I've ever seen a high school lunch period this quiet." I think they caught us on a good day. But it was a nice compliment. I know our lunches aren't perfect. In fact, there were a few grapes flying around recently too. Kids will be kids, right? But I was a proud principal after hearing the visitor's perspective, because I think it is a small indicator of our culture. I was speaking with another educator who shared, "At my previous school, we had to have supervision all across the lunch room to keep everyone's behavior in line." It sounded like they had a bunch of people on guard to make sure there weren't any problems. It's possible to achieve good behaviors by "running a tight ship" or by being "heavy handed." There are lots of ways to influence behavior. And forcing compliance is one way to change behavior. Fear is a way to change behavior. Sticks and carrots are a way to change behavior. So don't mistake a culture of compliance for a culture of character. There's a difference in doing the rights things, and doing the right things for the right reasons. What happens when the adults aren't watching? How will the students act in those situations? That's when character is revealed. We can keep our thumb on them to get what we want, but are we really helping them develop the decision-making and responsibility they need? I want students to learn why character matters. I want them to show empathy. I want them to be upstanders and not bystanders. I want students to understand how they treat all people makes a difference. I want students to know it's important to be honest, with themselves and with others. I want students to learn to admit mistakes and move past them in a positive way. I want to see students take full responsibility. Ultimately, my goal is to create an environment that brings out the best in our students. I want them to feel supported and valued. And I want them to know I have very high expectations for them, not because of what they do but because of who they are. I believe in you, want the best for you, and I'm here to support you. That's the message I want to send. I think the traditional model of education has been very focused on compliance. In fact, compliance is often celebrated. I've had parents and teachers talk with admiration about teachers and administrators who ran classrooms and schools with an iron fist. They applaud the strict adherence to commands and rules. I have to admit that used to impress me too. But not anymore. I've come to realize that schools can be extremely orderly and run with precision and under the surface have a character deficit. I'm all for discipline, but I want to see that students are taking ownership for their behavior and can self-manage in positive ways. I want to see students empowered to do good and make a difference in the world. That won't happen in a culture of compliance. It will only happen in a culture of character. Is any of this making sense? I want to hear from you. I'm convinced that teaching character and developing it in our schools is as important as ever. What do you think? Leave a comment below or respond on Twitter or Facebook.